The Ejscript Web Framework was designed to make it dramatically easier to create dynamic web applications. The web framework provides an application generator, templating engine, a powerful Model/View/Controller framework and a library of Ajax view controls to take the tedium out of creating web applications. Via this framework, Ejscript drastically reduces the number of lines of code you need to write for a compelling, dynamic web application. This document describes the Ejscript Web Framework and how Ejscript is embedded in web servers to run web applications and respond to web requests. It describes the flow of execution and the main processing components. See also the Ejscript Language Architecture, Language Tour and the Web Tour. The Web Framework builds upon the Ejscript core language and provides a web request handler, a Model/View/Controller application framework and an edit-and-continue development model. The Ejscript Web Server Interface (or web interface) provides the interface and coupling between Ejscript and the web server. It accepts incoming web requests from the web server, routes the request to the appropriate application or ejscript web page, processes the output and passes it back to the web server for transmission to the client. The Common Gateway Interface (CGI) is a standard protocol for hosting applications in a web server. CGI offers good stability but low performance. FastCGI is a replacement for CGI. It provides higher performance than CGI by supporting multiple Http requests per FastCGI instance. It also offers improved stability by isolating application instances. Custom in-memory modules offer the highest performance. 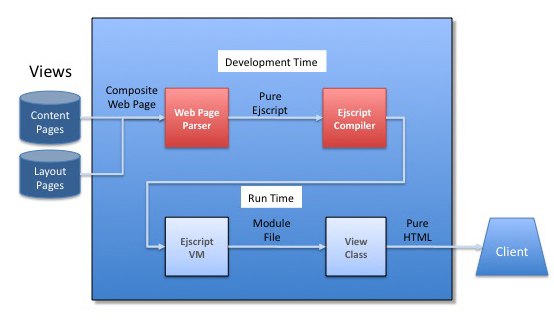 Ejscript provides modules for Appweb and Apache. The custom module, mod_ejs, provides excellent performance but less application isolation than FastCGI. This instructs the web server to send all requests with the URL prefix "myAppName" to Ejscript for routing and processing. Ejscript replaces environment variables with a params collection object and it transparently converts form data into a nested collection of objects. It automatically converts dot separated form names into objects that are addressable by dot notation. The web interface will construct request, response and host objects that store request state. Ejscript avoids the normal overhead in creating and populating these objects by using virtual, lazy construction. Consequently, Ejscript applications incur minimal overhead when accessing request state. A high performance web server must accept incoming requests, route to the appropriate request handler, initialize the handler including necessary interpreters, gather response data, transmit to the client and then tear down the handler. And this must be done many times per second, ideally hundreds of times per second for dynamic content. To do this effectively, Ejscript pre-creates a master interpreter instance replete with all the requisite system classes and web framework. When incoming requests arrive, the web interface quickly clones this master interpreter to create a light-weight copy that is dedicated to the new request. The clone leverages the system types and web framework in the master and so needs minimal initialization before it can start servicing the web request. Clone interpreters are not completely isolated. Controlled session state sharing is accomplished by sharing session and application objects. The web framework supports two kinds of Ejscript web applications. 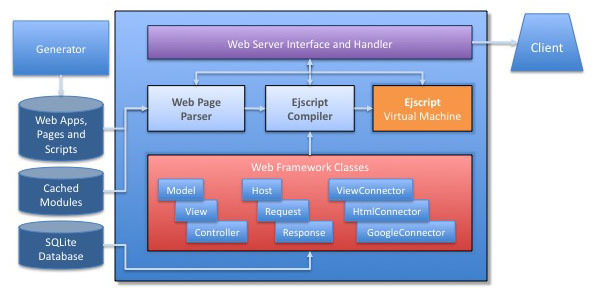 Stand-alone web pages use embedded Ejscript code but do not use the full Model View Controller paradigm, nor do they use the application generator. They typically use a "Post-Back" paradigm where form data is posted back to the same page. The do not have controllers, models or view layouts. MVC applications are more powerful. They have database models, controllers, views and layouts and typically start life by using the application generator. This creates an application directory and populates it with the necessary directories, configuration files and stubs to begin the application. During development time, the web framework uses mvc behind the scenes to transparently recompile all or portions of the application if the developer modifies any model, view or controller. A Model View Controller framework, also known as MVC, is a proven paradigm for organizing web applications. The model manages the state of the application including the database. The controller manages the application, responding to inputs and invoking the relevant views to generate the user interface. The web framework provides a powerful set of access methods to query, join, update and deal with SQL tables. You can use higher level functions where the ORM generates appropriate SQL statements or you can construct and issue your own SQL. The ORM Methods include: belongsTo, find, findAll, findOneWhere, findWhere, getColumnNames, getColumnTitles, getDb, getKeyNme, getNumRows, getTableName, hasAndBelongsToMany, hasMany, remove, save, saveUpdate, setKeyName, setTableName, sql and trace. The Ejscript ORM currently only provides one database connector for SQLite. It is expected that a future release will add support for other major database engines. The View part of the Ejscript web framework is responsible for generating the user interface. It typically takes an input HTML web page with embedded Ejscript and generates the HTML response to send back to the client. However, views can also be generated by controllers and thus require no HTML page. The View mechanism consists of a processing pipeline that progressively transforms the web page. Views start with a partial HTML view page which typically contains embedded Ejscript. This is parsed by the Web Page Parser and combined with layout views to create a composite web page. This is then parsed and converted to pure Ejscript code which is compiled and cached in a module file (.mod). The module file can be run repeatedly by the VM to generate the required HTML for the user view. The time-intensive part of this pipeline processing occurs once, at development time. This is comprised of the pipeline stages up to and including compilation. The often less costly run-time processing for each request consists of reading the module file and executing it in the VM. A templating engine is an important part of a view framework. It allows you to specify the "look and feel" and standard components of a web application in one place, and then reuse the "look and feel" in content pages by simply referencing a layout page. The layout page typically contains the top level HTML structure, style sheets and graphic content that is standard on every page. It also specifies the location to insert content from content pages. The content pages focus on the content and data unique to that page and they do not replicate the standard content specified in the master page. In this way, changing the layout page in one place will automatically change every web page in the application. The web page parser reads the content view pages that contain embedded ejscript code (with .ejs extension). It blends the content page with the layout pages and converts it to a pure Ejscript program (with .es extension) which represents the composite web page that the user will see. The <%@ content %> directive instructs the web page parser to insert the content page at this location. The @@title and @@style directives access Ejscript variables set to the required content title and style sheet at run-time. The web parser supports the following web page directives. These can be used in layout or content pages. The <%= ejscript expression %> directive will evaluate the expression and substitute the resulting expression value. The @@variable directive is a shortcut for <%= expression %>. The <% ejscript code %> directive will invoke the given code. No automatic substitution of output occurs. However, the code can call "write()" to generate output in the place of the directive. The <%@ include "filename" %> directive will include the given file name at the location of the directive when parsing the web page. Include directives can be nested. The <%@ layout "file" %> directive specifies the name of the layout page. By using this directive in layout pages, you can build up the web page layout by nesting layout pages. If omitted in content pages, which is usually the case, the default layout is layouts/default.ejs. If omitted in layout pages, it is assumed the layout page is the top level layout page. NOTE: you do not have to use layout pages. Simple stand-alone web pages without layouts code are supported. To disable templating, use a <%@ layout="" %> directive. The web framework provides a suite of view controls for common UI elements. These include button, chart, checkbox, form, image, label, link, list, progress bar, radio button, table, tabs, text, textarea and tree. The purpose of the controls is to be a themeable and skinnable set of UI controls that provides a higher level of functionality than bare HTML. For example, the table control allows the easy display of database data with sortable rows and selectable columns. The view controls are implemented via View connector modules that communicate with the web framework's View connector interface. This is a modular interface for industry Ajax and UI toolkits. The Ejscript web framework provides a HTML view connector, and a Google Ajax Visualizer connector. Users can select which connector module to use for a specific control on a control by control basis. Additional Ajax connector libraries will be supported in the future. The controls are bindable to data stored in models and many controls can dynamically refresh their content using Ajax techniques without redisplaying the entire page. Views can also use a library of view methods to generate and manage HTML output and responses. These include: redirect, render, setCookie, setHeader, write, writeHtml and writeRaw. The role of the controllers is to manage the application and respond to inputs so controllers form the heart of the web application. Controllers are typically bound to various URLs so that user input is routed to specific actions within the controls. When a controller receives an incoming Http message, the requested action is run. The action will typically mutate the state of the application in some manner and then render a response view to the user. Where APP is the name of the application, CONTROLLER the name of the controller and ACTION is the name of an action method within the controller. When such a URL request is received by Ejscript, it routes the request to the specified controller and invokes the action method. The routing format is fully configurable and can be customized to suit your exact needs. The action responds to the request by examining the request form parameters, query string and other Http and application state information. Here is a sample action method that updates a database table based on user submitted form data in "params". An action method can explicitly render data by calling one of the render() methods. It can redirect the client to a new URL via the redirect() method. Manual rendering is ideal for "RESTful" web services, particularly when coupled with the XML/E4X capabilities of Ejscript. If the action method does not explicitly render any data, the web framework will automatically render a view page of the same name as the action method. That view has access to the controller and request state. Other methods used by Controller actions include: cache, createSession, destroySession, escapeHtml, html, inform, keepAlive, makeUrl, render, renderFile, renderXml, reportError, setCookie, setHeader, setHttpCode, setMimeType, warn and write. There are two phases of use for Ejscript: Development and Deployment. When developing, developers need quick turn-around with rapid test-modify-build cycles. Interpreted languages have a distinct advantage over traditional compiled languages when used for such iterative or Agile Web Development. Ejscript offers the best of both. When developing, Ejscript runs as an interpreted environment. Changes made to web pages or scripts cause the files to be parsed and compiled without restarting the web server. Simply reloading the web pages in the browser will trigger the changed page to be rebuilt. When ready for deployment, the entire application can be compiled into a single module file for easy deployment.